This page contains links to some of the digital content from projects developed, in whole or in part, by SophSoft, Incorporated and/or its principal, Gregg Seelhoff, as well as information about some of the retail games on which we have worked. Demolish! Pairs is a unique and enjoyable puzzle/arcade game published by our Digital Gamecraft division. It was designed and developed entirely in-house, programmed in native Objective-C and built for all iOS devices, including iPad, iPhone, and iPod Touch, and both 32-bit and 64-bit devices. Demolish! Pairs FTP is the (iPad only) free-to-play version. 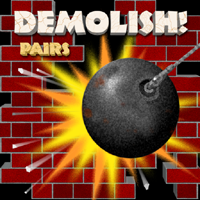 Visit DemolishPairs.com for more information about this game. Free promotional codes available by request. Pretty Good MahJongg is a classic puzzle game which contains 320 tile matching layouts, along with a layout editor, and also 55 original solitaire games played with mahjongg tiles, supporting numerous tile sets. We co-designed this game (with Thomas Warfield of Goodsol Development) and developed it entirely for both Windows (initially), in C++ using Visual Studio, and Mac OS X, using Objective-C++ in Xcode. It won the 2007 Shareware Industry Award for 'Best Non-Action Game'. Pretty Good Solitaire is the premier computer solitaire program available, with 550 different solitaire games supported in the Mac and iOS versions, and 850 games in the flagship Windows version. We designed and developed the versions of this game for both Mac OS X and Apple iOS, using Objective-C++ in Xcode. The initial Mac version was written using Carbon libraries (as recommended at the time), and recently slightly redesigned and ported entirely to Cocoa frameworks. For the Windows version, we originally wrote a supporting graphic card library [gdcard.dll], using 80x86 assembly and C++, that continues to be integral in that (Visual Basic) version 13 years later. MVP Backgammon Pro is a classic backgammon game that supports play against another player in person or online, or against a variety of different computer players of skill levels ranging from hopeless to expert. Features include adjustable rules, including both Backgammon and Acey Deucey, isometric (simulated 3D) graphics in a window or full screen, different board and checker sets, voices and sound effects, background music, move lists and hints, online play, and neural network AI evaluators, including one (Copernicus) that plays world-class backgammon. Action Solitaire is a collection of 75 solitaire games played against the clock in timed rounds. The player has a target score which goal must be reached in order to advance to the next round and continue the game. We designed and implemented this addictive game, intending to give our more competitive customers a product that allowed them to demonstrate their solving skills. The game was developed for Windows using C++, with some 80x86 assembly language, in Visual Studio. A large component of both the experience and the programming was interaction with an online high score server to report scores and monitor progress during a game. Most Popular Solitaire is a collection of 30 of the most played solitaire games, including Klondike ("Solitaire"), FreeCell, and Spider, as well as 13 bonus games. Goodsol Solitaire 101 is a collection of 101 of the most popular solitaire games from the Goodsol collection, along with 34 bonus game variants. FreeCell Plus is a collection of 8 FreeCell-type solitaire games, including FreeCell itself and favorites such as Penguin and Sea Towers, plus 4 bonus games. A Little Solitaire is a collection of 9 very popular solitaire games, including Klondike ("Solitaire"), FreeCell, and Spider, exclusively for iPad users. We designed and developed the Goodsol Solitaire Engine, which is a cross-platform engine for solitaire games, and each of the above 4 titles are products built from this base engine. The engine was first built for Windows using C++ in Visual Studio, then ported to Mac OS X and (finally) Apple iOS using Objective-C++ in Xcode. The core engine code is identical for all three platforms, supporting both 32-bit and 64-bit builds. The technical design follows the MVC pattern, with interface code different for each platform, but the supporting data, including game information, card sets, and saved games, are 100% interchangeable. In addition to the implementation of the engine, we also performed the design of the solitaire game data format, specifying a custom XML format that completely describes most solitaire games, developing a game editor that allows one to fairly quickly create and test brand new solitaire variants, including (per requirements) matching exact deals, by number, from the original Windows version of Pretty Good Solitaire. Mission Critical is a first-persion graphic adventure for DOS, developed by Legend Entertainment. Mission Critical was named "Game of the Year" for 1995 by Byte Magazine. SophSoft designed and programmed three minigames for Mission Critical, two of which became integral pieces in solving the game. Our Coolant System Puzzle required players to manually redirect cooling fluid through the reactor system to prevent a meltdown. Our Faster-Than-Light Communications Puzzle challenged players to safely route a message through satellite relays, some of which were compromised by the enemy; this puzzle featured a scientifically accurate 3D representation of the near-Earth star system (i.e., real stars in their correct positions), which players could rotate arbitrary to examine the current relay path. Our third minigame, the Alien Gateway Puzzle was ultimately unused in the product. Star Trek: The Next Generation, "A Final Unity"
Star Trek: The Next Generation, "A Final Unity" is an adventure game licensed from Paramount Pictures, developed and published by Spectrum HoloByte for DOS (Extended). The game was featured on the cover of the April 1994 issue of Computer Gaming World, a leading entertainment publication, and was one of the most anticipated games of 1995. Immediately prior to taking SophSoft full-time, Gregg led the technical design and implementation of ST:TNG, "A Final Unity", as Senior Software Engineer at Spectrum HoloByte and Lead Programmer on the project. In this capacity, he specified the pioneering conversion to 32-bit protected mode, VESA graphics and digital video, and CD-ROM distribution, as well as a speaker-independent voice recognition system from IBM that was ultimately omitted from the game. He implemented the first version control system and code management policy for the PC Group, performing daily game builds. He retained personal responsibility for programming and maintaining the library routines, developed in C++ and extensive 80386 assembly language, including DPMI support for multiple DOS extenders. Legacy of the Ancients is a classic role-playing game (RPG) developed by Quest Software and published by Electronic Arts. The Apple ][ and Commodore 64 versions were published in 1987, and the PC/DOS version was published in 1989. The PC version of Legacy of the Ancients was the first retail game title on which Gregg worked. He was hired by Quest Software to program discrete parts of the (delayed) project to speed its progress, and he quickly became integral to the development, ultimately being trusted to perform the final build and integration, creating the "gold" diskettes shipped to Electronic Arts for reproduction. Initially, Gregg developed the Stadium Defender mini-games, primarily in 8086 assembly language, which led to programming the BlackJack mini-game in Turbo C, integrated with Microsoft BASIC used for the main engine. He then programmed a custom sound library that used direct manipulation of the sound chip to create sound effects, designed and programmed a diskette management system to minimize disk swapping during gameplay, and created the main menu and credits module. Additionally, he performed extensive consultation (and debugging) to help the main programmer finish the core engine of the project in order to get the title shipped. The Legend of Blacksilver is another classic role-playing game (RPG) developed by Quest Software, this one published by Epyx, as an indirect sequel to Legacy of the Ancients. The Commodore 64 version was published in 1988, while the version for Apple ][ was (nominally) published in 1989, as Epyx went into bankrupcy. Gregg was the Lead Programmer for the Apple version of Legend of Blacksilver, responsible for all programming on that platform. He ported the game from the already published C64 version, programming the complete game function library in 6502 assembly language, interfacing with Applesoft BASIC control code, as well as developing internal tools used during development. He also created custom diskette launch bootstrap code for Apple floppy drives using a PC cross-assembler. Additionally, Gregg implemented the Hard Rock Runner mini-game for the unpublished PC/DOS version when Epyx wanted to omit it, claiming that it could not be made to work on PC systems. Microsoft Plus! Game Pack: Cards & Puzzles was a collection of games exclusively for Windows, published in 2000 by Microsoft. The "Cards" portion of the title was the Bicycle Card Collection, which contained 12 different card games playable online, via network, or against computer opponents (with human avatars). SophSoft programmed all networking functionality for the Bicycle Card Collection, designing and implementing the WEPNet dynamic multiplayer library, and also created the interface and character artwork. The game supported peer-to-peer networking and player chat via DirectPlay, as well as online play on Microsoft Gaming Zone via DirectLobby. Although the product was complete in 1999, prior to Windows 2000 retail launch, Microsoft chose to delay publishing about 9 months for simultaneous release with Windows Me. Throughout development, only 2 bug reports (of several hundred) were filed against the multiplayer code; one was proven to be a bug in Windows 2000 and the other a bug in DirectX.